Total advertising expenditures fell 12.3% last year to $125.3 billion as compared to 2008, according to data released today by Kantar Media. 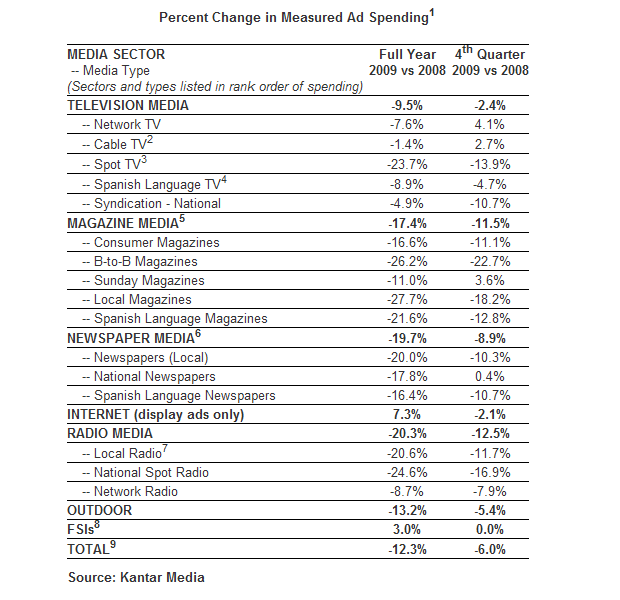 However, Q4 2009 ad spending was off 6% against the year ago period, with nearly all media improving upon their January-September performance. Zooming in on the digital part of equation, Kantar Media says Internet display ad expenditures actually increased 7.3 percent in 2009, aided by higher spending from the telecom, factory auto and travel categories. You can find more figures and insights in the press release.